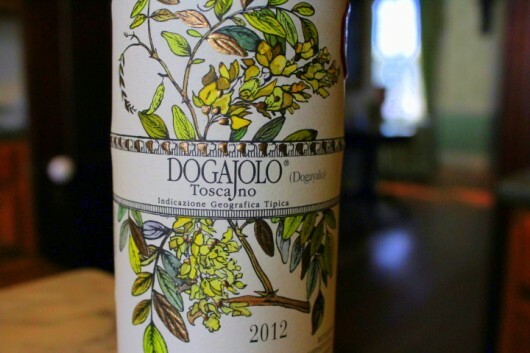 Because we need something to drink as we walk, I’ve opened a bottle of 2012 Dogajolo. 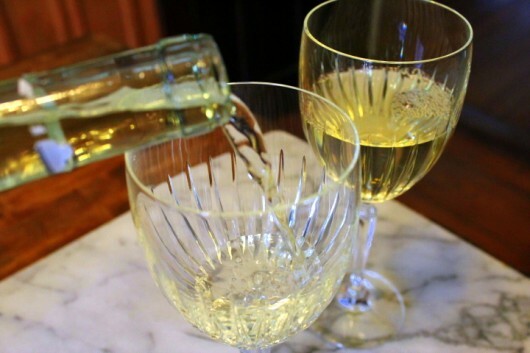 Are you familiar with this blended Italian white wine? It’s incredibly crisp and fruity. Just like your host. We are in the upstairs guestroom now, looking down at the Rose Garden. 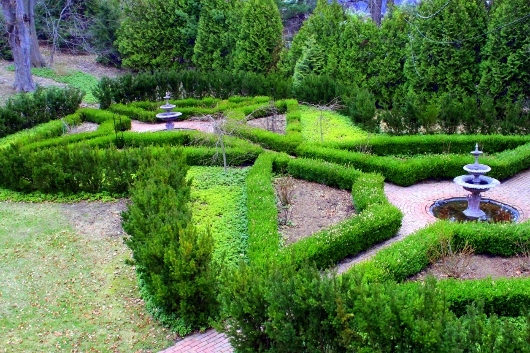 Surrounding this plot in a figure-8 pattern are 190 yews (Taxus hicksii). And edging the 8 rose beds are 320 boxwoods, most of which I grew from cuttings. 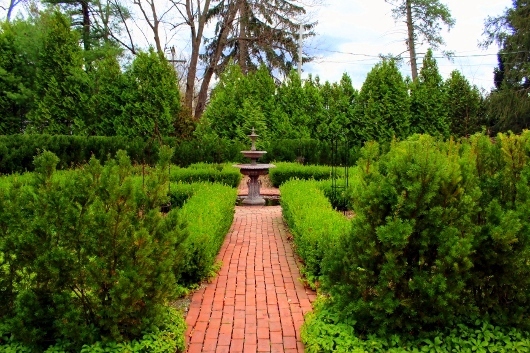 The yews, which entered the garden in 2004 as tiny, 8-inch tall shrubs, and which grew very slowly into a handsome, 6-foot-tall hedge, were in dire need of a haircut. Mr. G., above, managed the job in only 30 minutes. 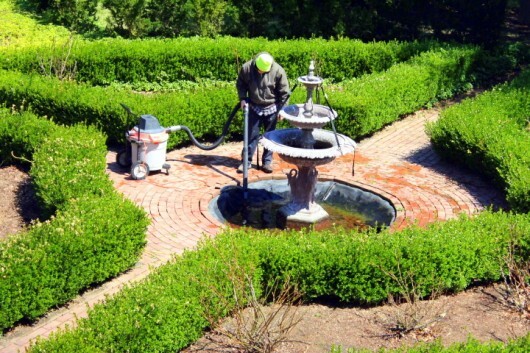 He’s returning next week to prune and shape the boxwood. They are currently being cleaned and repaired by Mr. B. I hope the roar of his wet-dry vacuum doesn’t offend you. Some sad news. I lost several David Austin roses during the dreadful winter of 2014. I know they are dead, because I scratched their lowest canes, and found not a trace of green. Fortunately the vast majority of the roses are still among the living. These were recently pruned, and then fed an organic formula. I don’t use systemic pesticides (or any pesticides, for that matter) on my roses. Why? Because these products infect the entire plant, including the pollen that bees gather. The only warm-weather treatment the shrubs receive — if I’m feeling energetic — is a weekly spray of plain milk. Yes, milk. It’s as good as anything for controlling blackspot. Swoosh! We are at the entrance to the Serpentine Garden now. As you might recall, I carved this garden into a hillside that was too steep to mow. The details. 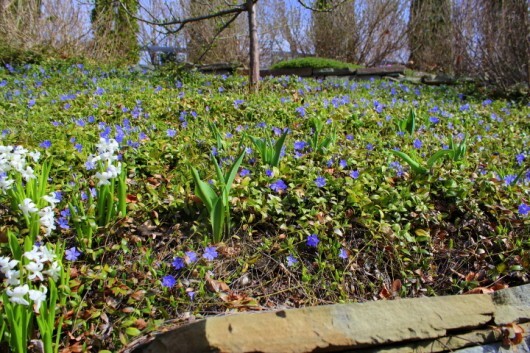 The garden’s second terrace is a sea of blue just now, courtesy of the Vinca minor I planted there 8 years ago. Sprouting through the vinca are dozens of soon-to-bloom tulips. And these blue-striped white Puschkinea. I’ll hold your wine while you bend down to sniff the dainty flowers. 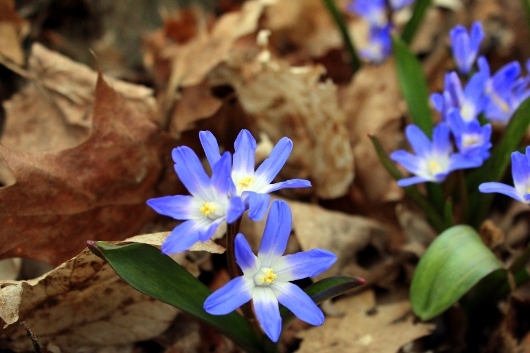 Although I did not plant them here, oodles of nodding Scilla siberica are blooming in the Serpentine. I love them. Also strutting their promiscuous petals are clumps of species tulips. These are the tiny ancestors of the tall, familiar Dutch tulips. Pictured above is ‘Dasystemon Tarda,’ a sweetly-scented, yellow-and-white variety. 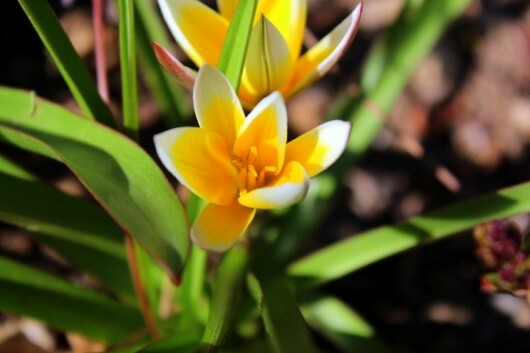 If you’ve never tried them, species tulips are a cinch to grow. They are also easy to force for indoor winter bloom. I had intended to walk you through the Woodland, Kitchen, and Herb Gardens today. But now the wind has kicked up, and the temperature has dropped. So let’s head back to the house, where a refreshing dessert awaits. As we sit in the parlor and enjoy slices of The Best Lemon Tart in the World, perhaps you can tell me what’s happening in your own garden. As always, I cherish your thoughts. That’s a shame about your roses. Mine have a lot of die-back but seem OK. Can’t wait to see your and my blooms! 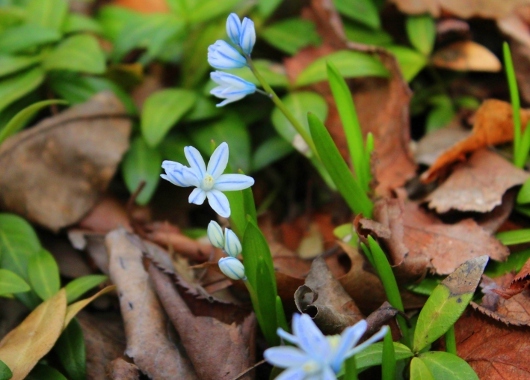 I have about a billion of these little purply-blue flowers that spread all over the lawn (never figured out what they are) and are lovely, a few random daffodils that I didn’t plant and the beginning of some white and pink bleeding hearts. Plenty of buds on the sour cherry, pear and apple trees. Other than that, garlic and bunching onions are poking out of my veggie beds. This weekend is a weekend of expanding some garden beds and amending with compost. And maybe some bread baking, as it looks like it’s going to be a chilly and rainy Saturday. It’s still not decided if it really wants to be spring here in Zone 4b or not…! Hello Kevin! I have questions about the technique of spraying the roses with milk. 1. what time of day should I spray? Should I not spray in direct sunlight? 2. Do I need to spray again if it rains within a few hours or a day after spraying? I live in Oregon where we get ALOT of rain, therefore I’m assuming the milk will be washed off. With all this moisture blackspot is a huge problem here! Help!! Parsley, Basil and Purple Basil, Mint ,Thyme and Tarragon. Oh almost forgot my Very Hot Peppers for jelly. I had a lot of die back on my roses this year and had to prune back hard, but the bud unions all survived and are already sending up new growth (I’m in zone 6). Scrape a bit of earth away and see if you have any buds at all before you dig up the entire plant. Kevin, wonderful stroll as always! Thank you for the inspiration you give me! During our dinner tonight we were talking to our kids, 8,9,10&12 about jobs. I used you as an example saying if your job is what you love, it doesn’t feel like work. That must be the ultimate, loving what you do! The wine was perfect!! I found a bird egg today as I was mowing. It was cracked:( I am starting to plant in the garden and think I will add more geraniums just because. The red knock out roses started blooming today. Let me mention the four large dogs that enjoy the same part of the garden. They are very sturdy and don’t mind the attention the English roses get:) I hope to add some orange knock out to the dog path. That lemon thing looks awesome! A very enjoyable garden tour, Kevin. The flowering bulbs are so pretty! 1. As Aris asked, when do you spray roses with milk and under what conditions? 2. What growing conditions are best for vinca minor? Beautiful garden & house. I took an keen interest in your winter sowing post, pretty interesting. I wonder if I could start a little project like this up here in Montréal, which is supposedly same hardiness zone as your place 5-b! 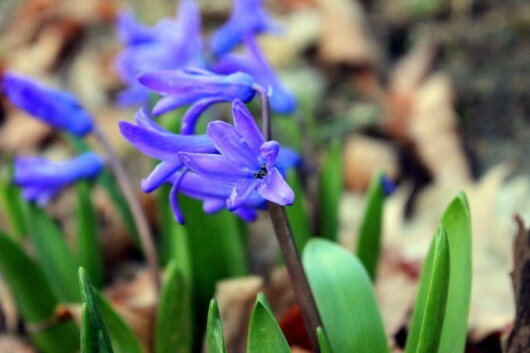 Scilla siberica started blooming like crazy last week up here but hyacinths flowers won’t be blooming for another week or so. What is the typical average night temperature when your start your winter sowing? My Chrysler Imperial rose bush seems to be a ‘goner’ also….and you’ve seen what old man winter did to one of my boxwoods down in my Madonna Grotto. But, as you’ve witnessed in my email pics, my Galium Sweet Woodruff is rambling all over my Woods Garden & our friend MR’s hellebore and trillium came back to say hello this spring. C U next month w/ a bottle of Pinot for a toast (or two) under the arbor. Thanks so much for the tour and the NAMES of tiny flowers. We usually go by what the Amish here call them. I’ll look up your names. I’ll have to try that wine. Went to a tree auction yesterday with one tree on my list and came home with 7. 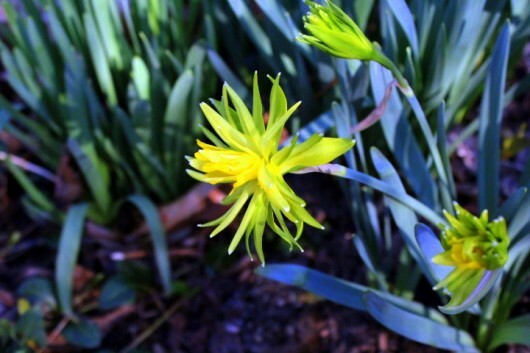 My woodland garden is flush with blooming bloodroot, wakerobin and vinca, also those fragrant Puschkinea and hyacinth and across the path the daffodils…all shades from dark yellow to white. The garden close to the front door is blooming with crocus (that just won’t quit!) and now the whit tulips are beginning to show their color. Peonies are poking their heads through …I feel so rich and lucky to live in the woods of Connecticut! I love your blog…my favorite place to go for some sunshine and happiness after my garden! Thank you! And I’m going to try that beautiful wine! Just beautiful, Kevin! Such lovely variety. 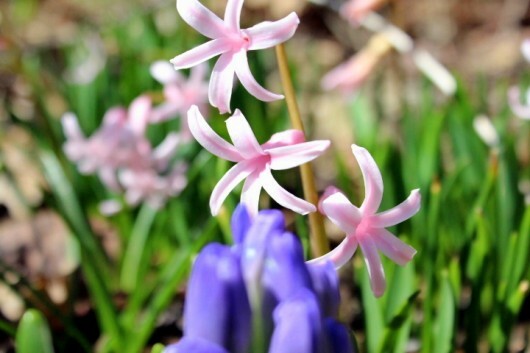 Nothing better to make your heart sing than happy spring bulbs. Even in usually balmy south Texas, winter was long and cold, by our standards. We lost all hibiscus, bougainvillea, and esperanza. They probably would have survived in the ground, but these were in baskets and pots and have been fine for years outdoors, but not this year. What’s happening in the garden? Figs are loaded, climbing blaze rose is abundant, pomegranate has set more fruit than ever before and we gave it a Wonderful companion friend, Meyer lemon and orange have set fruit, dead stuff composted, new fire engine red geranium and pink begonia color added for backyard replacement, replaced herbs that died, and tasty spring onions get put into every dish. I’m into adding more incidental edibles, so we will scatter Portulaca oleracea (common purslane) in various locations around the yard so it can naturalize. Also, have a few more flowering bulbs to put out. Waiting for a friend to divide his iris after blooming, and then I’ll plant that. Oh, and I’m searching for a nice crabapple to compliment our apple trees. Loquat has enough fruit to preserve when it’s time. Every time your blog arrives, it’s a good day. Lemon tart on a beautiful plate made my mouth water. Thanks for the tour and the humor. Terrific as always. Love the wine n the lemon dessert! Best of all no calories! Just ordered some seeds n plants for the garden n will need another raised bed since I ordered more than I have room for. Still quite cool here in Kutztown PA. Should put one in for my dogs, they luv to lay in the sun there. The trees are blooming n the lily of the valley shoots are about 3″ high but tightly furled. I’m guessing it’s because of the cold. Dandelions and violets r blooming in the yard. I just trying to see the beauty and hope the goldfinches eat all the seeds! Love your newsletter! Great work! Thank you for the tour, looking forward to seeing the rest of your gardens. Also thank you for the milk tip. Lovely garden! I am in Southern California so many of those lovely flowers just don’t grow well here. Wish I had the wine, but the lemon tart is divine, made one for Easter, then made one for dinner party today and will make three for coffee hour at church next Sunday, they are that good! Thank you so much for the recipe. Still in the middle of adding and expanding my raised beds. I better hurry up, because my 3 boxes of Herbs from “The Growers Exchance” arrived and my WS seeds finally got their act together and started with a growth spurt. Kevin, by this afternoon I’ll need some of your Wine and Lemon Tart. And to all those other Gardeners whose “Eyes are always bigger, than what fits in the Garden”, welcome to the Club. I loved the tour, thank you so much. So sorry about your lost roses Kevin but I had the same thing happen several years ago with David Austin roses….not a bad winter either, I so enjoy your tours every Sunday…a good start to my day. That wine bottle looks like a keeper…hope the wine was a good as its bottle…. You have the best Yews. The ones that surround some apartment buildings here in NYC look so sad and disheveled. Our garden here in Southern Califonia is coming on strong! Can’t wait for the tomatoes!!! Finally the dreadful weather is leaving and the beauty of spring has returned. My magnolias just opened when we had another few inches of snow. They remain though due to the cold days. my veggie garden is underway and I’ve just harvested chives!!!! I am neither a cook nor a gardener, but absolutely adore following you along on tours of your gardens and vicariously cooking with your delightful step-by-step cooking lessons. Your blog is an online antidepressant! Uh … Lucy looks a trifle overweight. Too much cheese? My clematis are blooming, huge purple blooms and smaller white blooms. The crossvine on its frame is just starting to bloom.The iris’s are all in bloom. They were planted two years ago in the fall so this is the first spring for most of them to bloom.. It is such fun waking each morning and going out to see what has peaked out in the night and what color they are. Yesterday I moved all the plants I had overwintered in the garage outside into the yard. 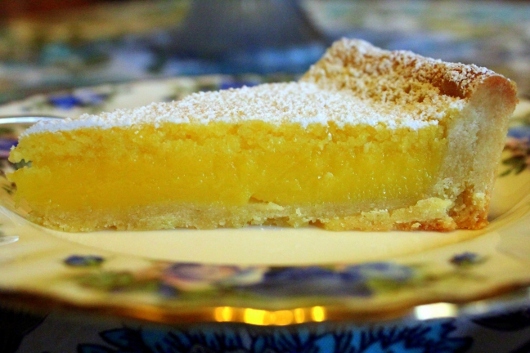 I made The Best Limon Tart in the World a few weeks ago, you are right! It is the best lemon tart in the world. Happy spring. Thanks for the tour, Kevin. Lovely and gracious as always! 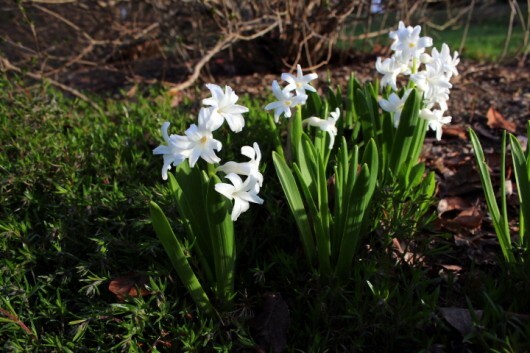 We are a month away from last frost but the little bulbs are in bloom and the daffodils are raising their heads. The grass has greened up and the native poplars are starting to leaf out. My daphne is in full glory and the hascaps (honey berry) I put in last year are blooming as well, not showy but hep I can beat the birds to the berries in June. Zone 3–4 here. If they are “own root” David Austin roses they may come. Some are hardy enough in this area like own root hybrid teas. We have an aging walker hound who in her youth looked a lot like Lucy . We often got asked if she was a giant beagle. Same hunting instincts but a much deeper voice. Thank you for the wonderful tour. I lost several roses and feel bad but in time I will find a hardier variety. Lemon tart looks great. Montreal: I am in zone 3/4 and have done some. A friend in town in an apt has done it on her apt balcony and had success in starting plants for her allotment garden. I do only things that need stratification but she does edible and ornamentals. I have registered for several prizes but always forget to check. How do I do that? IS there a link in this blog? Thanks. Your gardens are beautiful but, oh, so much work. I am lucky to stay ahead of the pepper, tomato and eggplant seedlings I am growing. I’ve managed to get all my garden beds raked out. I did a walk around yesterday looking to see what’s coming up. So far not much. My double bloodroot are starting to poke up thru the soil, tiny vinca leaves are showing themselves and tiny clumps of Wood Poppy. 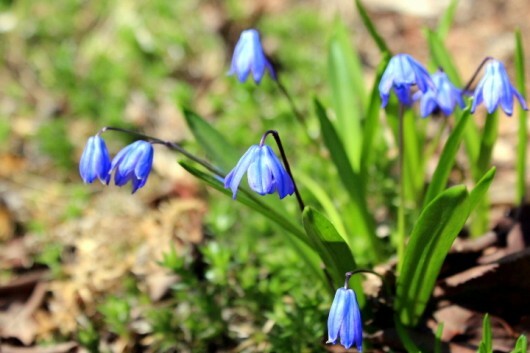 I do have several largish ( 5′ X 8′ ) areas of Blue Scilla that are starting to bloom. But that’s about all. I do have tulip and daffodils leaves up about 5″. No Hosta or Astilbe in sight yet anywhere. Today it’s been raining since last night. Several loud thunders last night in the wee hours = 3 am. Today several quite heavy rains have moved through. It’s only 38 degrees, windy and cold. I was hoping to do some dividing & potting today, for an upcoming plant sale, but I’m not going out there in this cold rain. Maybe tomorrow. Your tour was so beautiful. We are in zone 4 and getting tons of rain. We love our tall bearded iris which are up about 4 inches. We would love to get feedback from you and your readers about how to deal with iris borers. Thanks, Kevin, and slurps to Lily from Charlie, our boxer. Your tours are so fun, Kevin. Glad you didn’t keep us out there in that wind, tho’! And the tart was heavenly. I could eat a whole one. Guess I’ll have to make one of my own. Happy Spring! Happy Gardening to everyone! 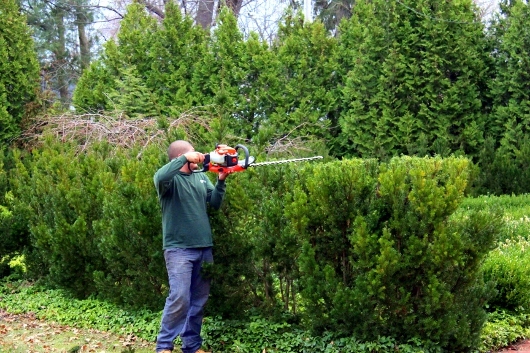 Could you show a picture of the finished pruned yews? Such a beautiful place you have Kevin! Kevin, you give me GARDEN ENVY !! and my garden a lot of hope! THANKS! I’m in So Cal and so excited about this spring/planting season. I’ve been unable to do much at all the last two years due to ongoing family demands on my time, but AM making time this year! When I finally took out my productive tomato plants at the end of last year, I took quite a few clippings and put them in water. Many of them rooted, not all of them thrived, but early this year I put the survivors into 1 gallon pots (with soil). I planted those outside a while back (sorry guys, but this is So Cal). They are thriving, have blossoms and *should* soon show signs of tomatoes! And, since this is going to be MY year to garden, combined with a wonderful family next door who is very willing to take any ‘overflow’ produce I generate, I’ve gone a bit crazy with planting seeds! Lots of cherry tomato plants up and already out in the garden, probably a dozen cucumbers almost ready to go out, 2 zucchini almost ready to go out and then a ton of planted, waiting to spout/sprouting seeds: Roma Tomatoes, Early Girl tomatoes, jalapeno peppers (neighbor will make salsa/guacamole and share it with me! ), basil, red bell peppers, orange bell peppers, a couple more zucchini (I know, I know… I will regret having so many later), a few white pattypan squash, a few yellow squash and some catnip (for tea and maybe to sell for kitty lovers on Craigslist… we’ll see). Also, doing succession plantings of green beans, about 10 plants per round, will probably end up with 5-6 groups because they are SO good. So, I’m really indulging my love of planting seeds, watching things sprout, planting them out and enjoying the goodies! And that list doesn’t even include my fruit (blueberries, blackberries, figs, 3 kinds of seedless grapes, 2 kinds of apples, 2 kinds of pears, 2 kinds of nectarines, a golden plum, an apricot). And, even tho lettuce is a winter crop here (way too hot in summer), I’m going to try just a bit, and plan to harvest it very early so it won’t have a chance to bold (fingers crossed!). I’ll be back here in a few months talking about how much time I’m spending harvesting and putting up (I hope!!!). Hi Kevin! Thanks for the tour. We do a similar tour of our yard each evening to see what’s new. It’s so fun because each day something new is coming. A new neighbor gave me a tip I’ll pass along. If bunnies are destroying your spring buds, try placing hair from your hairbrush in the garden. We’re overrun with rabbits and the blood meal wasn’t working. There are some types of tulips they seem to adore. The hair works for me and I’ve heard pet hair can work too. So brush the cat and dog and save those handfuls! I hid the clumps under bits of mulch bark. I’ve also adopted your newspaper-then-mulch idea! It’s nice to put all those Sunday New York Times to good use when I’m through reading al while saving me so much weeding. Thanks for the great ideas. Ps I plant my spent Easter lilies in the garden. They come back the following summer tall and fragrant. I think they’re called Madonna lilies or something like that. In Wisconsin they bloom midsummer. I love your blog! It’s the only one I ever open! I get so excited to see what you are going to share. My Atlanta garden is doing quite well. I lost a “Mr. Lincoln” rose over the winter myself. I’m disappointed it was a gift from Mother’s Day 2012. I’m not going to re-place it, this is a tough area for roses. I lost a few other things that I don’t even know what they are called. I spent today pulling up over 100 pine trees seedlings. I moved some creeping Jenny to an area that is suffering from erosion. It will fill in nicely. I have a hasta that is taking over my walk way even though I split it last year. I think it made it bigger. Not sure what to do with it now. My Japanese Maple that over hangs our 35′ stream is becoming quite full & I think I’m going to thin it out so I can see through it. My mulch is waiting to be spread, however the pollen count is still high & I can only do a bit at a time. All my bulbs are spent and I’m waiting for my drift roses to bloom for some color. My roses had a tough winter here in Cleveland as well. Perhaps you can give some guidance next fall on how to better protect our roses if there is another harsh and long winter season. Crisp and fruity, huh? You are ADORABLE…..! Oooooh, love those RipVanWinkle Daffodils. Only a few greens poking up now, nothing blooming. My prized fern leaf peonies are about 3 Inches high! Tulips about 5 inches! I don’t grow roses. I know my limitations! Will enjoy yours! Thank you!! 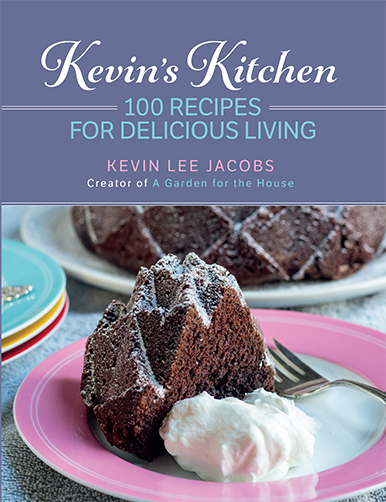 Hello Kevin, Thanks for your wonderful blog with unending ideas and inspiration. I have a problem, that perhaps you may have an idea for me. I have a yard with a LOT of rock in it. My husband built a screen that we lay on top of the wheelbarrow. We shovel on top, and sift the dirt through the screen to remove the rock, but it is a hard and tedious job. The sizes of the rock vary from small to approx. 8 in. in diameter. We haven’t done this for a few years, and those rocks are multiplying! My dilemma: What to do with all the rocks? Any creative ideas? I am thinking about making a retaining wall for a raised garden bed but not sure how to hold the rock together.(Cement?) 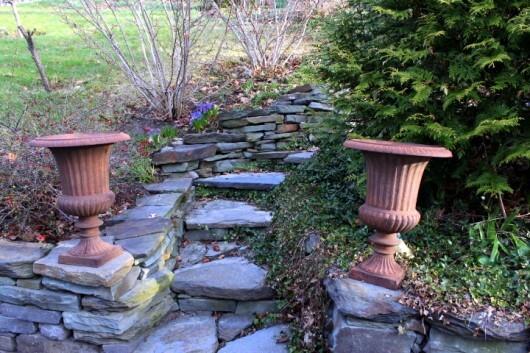 Have you recycled rocks into something useful? I have a small yard, with several small gardens, including a Japanese garden with only brightly colored peonies and an alpine garden with aspen, ponderosa pine and columbines. I have bordered all of my gardens with boxwoods and canopied the entire yard with autumn blaze maples. This spring is the best it has ever looked! We even had a couple of ducks fly in to check it out! I also want to thank you not only for the beautiful tour but also for the milk/roses tip. I only have two roses growing (I don’t actually care much for roses but there were two here when we bought the house) and I don’t like using pesticides for anything. We have two dogs and I worry about them getting into contact with poisons but also I grew up with bee hives and know that there is getting to be a shortage of them and worry about all the pesticides being used by my neighbors. I now have a rose milk bath on my list of things to do. Thanks for being so knowledgeable and sharing that knowledge. I have tulips daffodils and hyacinths blooming . I too have species tulips and enjoy them as flowers. along the garden path. Kevin, I, too hate to use pesticides, however, what in the world does one do with June bugs on their roses! How blessed you are to have SO MUCH BEAUTY! Thanks for the hint about milk and roses. My guest house neighbor received a rose bush as a housewarming gift. We will use milk! We have onions that look like elephants, so much heat that all the other flower are gone, the trumpet vine is starting to climb the trellis, the tomato plant is thriving as is the one okra. That’s all folks! Off to Italy! & daffodils. This week it warmed up more to 63 degrees & as I had added dry horse manure to my garden beds the tree peony bursts into bloom next day the Purple iris. I wish there was a way to send you my photos. They are a welcoming sight to my FB friends to view my garden in different stages. I hope you find that your David Austin roses didn’t really die off. I have a Abraham Darby that I just love….So I have over time taken cuttings & made new plants. This way I am sure to not lose my fav roses. I have another method that also works well is to take a softer stem & scratch a small nick then bury the stem ..keep it moist then wait for it to grow it’s own roots Voila! new plant. I am sure You already know this but maybe other gardeners have not tried this method. Right now the Snowball bush is full of white blooms But we are having strong winds. The weather man says later the winds will die down to give us 68-70 degree warm days. I have started planting my small veggie garden,(made my rows) I put in seeds for green beans this summer (3 Small rows ) some to eat some to share with friends that can’t garden. 1 row of carrots, some different types of squash, the Tomatoes I bought are Early Girl ( 55 days) because even though I love the Heirloom ( 86 days) ones they take most of the summer for just one crop. Heirloom Tomatoes though have such a wonderful yummy flavor. Some peppers. Last year I started 2 rows of strawberries ( my granddaughter loves to pick & eat them). They are starting to bloom white flowers So maybe in May or June we can have some yummy desserts? Kevin any Ideas?? And thanks for being such a gr8 gardening friend. I love when you include Miss Lily on your garden tours. What beautiful blooms you get to look at, for now I have my gorgeous hot fushia pink primrose to enjoy for the time being, and have 2 rose bushes to transplant that my father gave me, and have the perfect place for them. Thanks for sharing the tour, I enjoyed every photo! 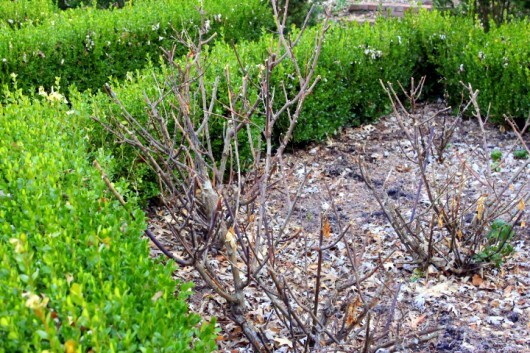 This past winter was a bad winter for Roses and perennials. Lost six Roses and many of my perennials. Enjoy your tours with Miss Lilly? Love your gardens! The tours are so much fun although I get a little jealous. I am in zone 3 and this winter was very harsh. Not much up here. A few tulips are starting to poke their heads up. Of course the deer have found them already! I usually don’t get much in the tulip department because the deer think I have provided them with a very special Bed and Breakfast and they love it! .Guess I’ll have to figure out how to let them know they are not welcome at this inn! Hope you keep up the website. It is so entertaining and informative. Love it! I’m sure you must have written about this but what do you do about deer (yews, etc) and bulbs such as tulips and crocus with other animals. I am very successful with daffodils and hyacinths and most tiny bulbs that are marked animal resistant but I would love to grow tulip and crocus without a lot of extra work. As always I love to see your amazing garden and I love your witty banter with each picture. I would so LOVE to meet you and see your garden in real life, but I’m sure that will never happen as I live in BC, Canada. This year your posts on winter sown seeds inspired me to start 20 milk containers in mid March. I can now say that was the best gardening thing I have done in a long time. I will be doing at least double of that next year. They are all planted and doing great, miles ahead of anything planted from seed this spring. So cost effective as well. You said you lost some roses this winter….I as well lost some things over this unusual winter. A Becky Shasta Daisy, 2 Brunnera, a Ligularia, 4 asters and a large clump of Plume Poppy…….This is my second attempt a glowing Plume Poppy, a friend had given it to me from her garden where it is some what of a Big Bully…..I had a large corner to fill so thought I would try it…..Dead! On the bright side I discovered a Japanese Forest Grass that I kept covered this winter is up! Yaah!!!! My new raised bed Potager Garden is coming along beautifully. Peas, radishes, lettuces and beans from seed are all up and doing great. This is where your winter sown seeds come into the picture as I did mostly veggies. 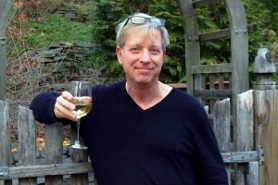 Thanks for all the inspiration this long cold winter…keep up the witty comments, I Love the wine and you make me smile! Many of the roses in my garden were started as cuttings from other gardener’s bushes. A few are rare, and one dates back to the time of Christ and Rome. I have a area in my garden that is moist-partial shade and it’s deep black in mulch. I’ll sink a branch directly into the soil or I’ll put the cut branch into a black nursery post and sink it in. In the Fall I’ll pull the pots out and put them where they will get winter protection. I’ll do this for a couple years until it leafs out well and has a good supporting root system. One years pruning on one rose gave me 24 new rose bushes. Do back-up’s like this at pruning time and you’ll always have replacement roses in the event of a loss and a rose to give as a gift! Just took your Sip and Stroll-mine was with a cup of stiff British tea though-a but early for me for wine. I spent Saturday shopping for annuals for deck and front porch planters and then came home to transplant seedlings from my winter sowing. I was not familiar with this technique till I was introduced to your website last year. I had fabulous success here in my Kansas City garden. I now have a bumper crop of lupines, delphinium (my fav blue flower) and sweet pea. I started all of these in February. I wish I had done some tomatoes too-when should I have started annuals? I also trimmed my boxwood (which I love) and planted the cuttings so I can have more. A productive weekend so far! After a nice rain last night, I hope to do some more perennial bed clean up and plant a few additions I picked up yesterday. I so enjoy your posts and recipes! Thank you. Also, are you familiar with an annual salvia ‘Blue Angel’. I’ve started some seeds-it’s a brilliant blue with a large bloom. Again, thanks for your informative and delicious posts! I love how God’s designs are beautifully blooming with amazing colors and shapes!